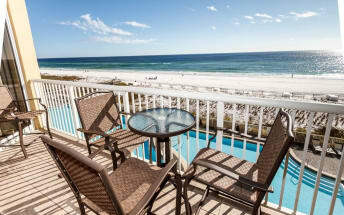 Waters Edge is a Gulf front condo complex in Fort Walton Beach, Florida. These beachfront condos sit directly on the white sandy beaches in Fort Walton and provide guests with amazing ocean view from each condos private balcony. As far as location goes, Waters Edge is in a fantastic spot. Fort Walton Beach offers plentiful shopping and activities. Waters Edge is also just a short drive to Destin, Fl. This complex is great for a couples getaway or a family vacaiton. The facility makes beach access very easy, there is covered parkeing and a community pool; everything you will need for a memorable vacation! Waters Edge is conveniently located near countless things to do in Fort Walton Beach. Fort Walton Beach is home to many water sport activities like paddle boarding, skim boarding, parasailing, kite surfing and boogie boarding. Crab Island is an extremely popular attraction that is just a few minute drive or boat ride away. As far as dining, Fort Walton Beach is home to many world class seafood restaurants. Aj’s Seafood and Oyster House, Al’s and many others provide vacationers with endless meals on their trip. Guests can book Water’s Edge Condos on Emerald Coast By Owner. ECBYO puts guests in direct contact with Water’s Edge property owners and managers. Each ECBYO listing contains an Email Owner button and phone number for you to contact!